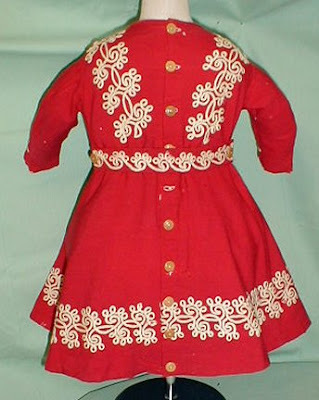 One way we can learn about making antique inspired doll clothing is by looking at clothing of the period. While searching through another group I came across these lovely antique clothing pieces on Ebay. So I emailed the seller, The Lady's Repository Museum, to ask for permission to post the pictures here. These items are presently at auction and might be appropriate in scale for a large doll from 1800's, or for an antique inspired doll. 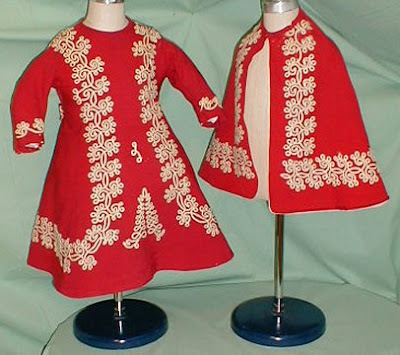 The first item is an incredible Victorian child's dress and matching cape which could be for either a boy or a girl. The wonderful deep cherry red wool has white wool braiding and vegetable ivory buttons, and hand done button holes. Look at the intricacy of the trim! Both the cape and the dress are fully lined in white cotton. The cape closes in the center front with one hook/eye closure.The dress measures 19" from shoulder to hem and the cape measures 14" cape from shoulder to hem. in this next sweet 1860's boys' garment. Double rows of braid make the blue skirt something special. Imagine these pieces without the trim. What a difference trim makes! white dress below makes this dress. What sets this set apart form others, besides the near mint condition, is the wonderful tabbed bodice with long revers that extend well below the waist line~ this most definitely belonged to a very well to- do little girl! I hope you enjoyed looking at these wonderful antique garments. If you are interested, please click the pictures to visit the auctions for more information. Many thanks to Rachael of the Ladys Repository Museum for sharing these lovely pictures of antique clothing. Click here to see more items in the museum. Wonderful post! She has the most amazing collection of early garments. She also makes stunning Queen Anne dolls, and restores antique dolls. A very talented lady. Can you imagine sewing on that intricate trim? A labor of love. Thank you Dixie and Rachael for a most beautiful post! Showing us these to enjoy is like giving us a lovely bunch of roses. Just a delight! The red red red one is my favorite, but they are all lovely. Oh Dixie, how awe inspiring! What a great post, and great photos. That red dress and cape are precious. WOW Dixie what beautiful articles of clothing. I'd love to own the white dress, just beautiful. I know! I love them all but the white dress is soooo wonderful. It is divine. Fantastic clothing! I have a question about the soutache. I have a bunch of it at home, but it's straight. How did they make it all twisty and twirly? Was it arranged and sewn on that way? Or was there a thread to pull to make it all twisty/twirly before sewing it? That is my burning soutache question for the day.